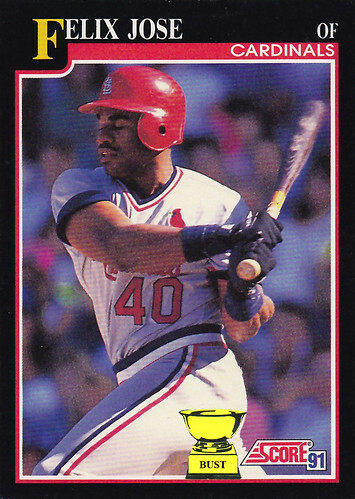 Felix Jose's train of thought from 2:19 to 2:20 p.m. May 28, 1990: "Dang, strike one. I never should have bet Willie McGee that I could get a base hit with my eyes closed. Whitey's gonna kill me! At least with my eyes closed, I don't have to look at Willie's face. Crap, strike two. I think I almost had that one, though. Oops, wait, I'm not actually in the batter's box. Isn't it weird that I have two first names? Maybe I'll name my kid Jose Jose. Ha! Little JoJo. OK, here comes the pitch. Ow! I can't believe I just swung at a pitch that hit me in the head!"